James “Jim” Thompson was born in the northeastern USA. He graduated from Princeton University and continued his studies at the Pennsylvania School of Architecture. However, Jim failed to obtain his degree due to his limited aptitude for calculus – join the club Jim! He still found work designing homes for wealthy clients of a New York City architectural firm, with certified colleagues signing off his blueprints. After some years in this job, Jim decided to join the Delaware National Guard Regiment in 1941 and soon married. Jim then signed up for the CIA forerunner known as the Office of Strategic Services (OSS). Jim’s first posting was to North Africa working with French resistance forces, then on to German occupied Europe to destroy enemy communication centres during World War II. Though Jim succeeded as a spy, he returned to the US, to find his marriage strained due to his long absence. He soon requested an assignment in East Asia to escape the tension at home. From one war zone to another, Jim would find himself working in the China-Myanmar-India conflict region before being sent to Ceylon, now Sri Lanka. When the war ended Jim remained in Asia, taking a post as a military attaché for the US embassy in Bangkok. Jim was enamoured by the city, soon deciding to leave the military and make a life in Thailand permanently. In 1946, Jim invested in the purchase of The Oriental Hotel Bangkok (now Mandarin Oriental), a once distinguished establishment that had been left to wrack and ruin. Jim’s wife wasn’t thrilled about the expat life he had planned for them, and the two parted ways. Furthermore, a disagreement with his Hotel business associates saw him give up his stake in the hospitality business as well. Jim was once again looking for a career change. 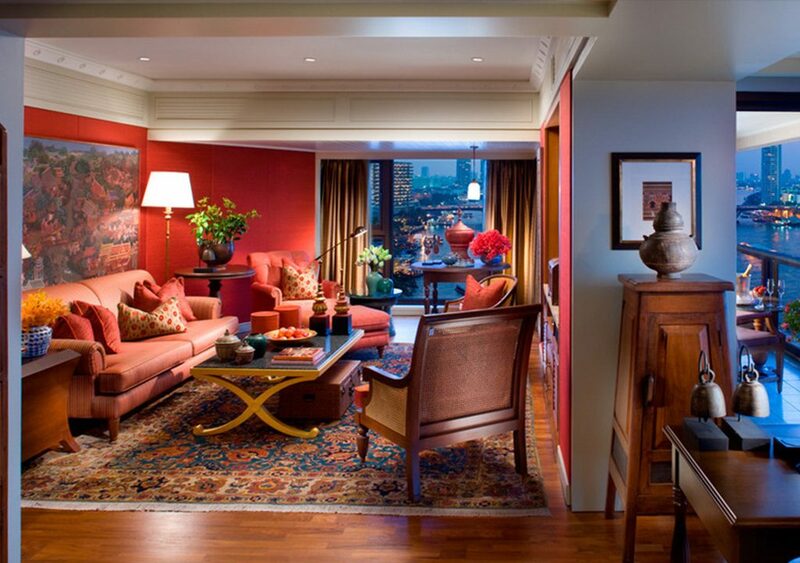 The Jim Thompson Suite at the Mandarin Oriental, Bangkok. Once The Oriental, owned by Jim. During his down time in Thailand, Jim had toured many of the remote outlying regions as far as the Laos and Myanmar borders. He noticed that it was common for Thai families to have a loom in their household and weave silk for their own use, but the lustrous fabric was not available on a large scale. The West had once treasured Thai hand woven silk, but since replaced it with cheaper, machine produced versions from Japan and Europe. As the son of a textile business owner, Jim recognised the quality of the material, and was enthused about its commercial viability. Jim took samples to New York to try his luck. A meeting with Vogue editor of the time, Edna Woolman Chase, sparked much excitement and led to his woven goods featuring in the next issue, styled into a dress by Valentina Schlee. 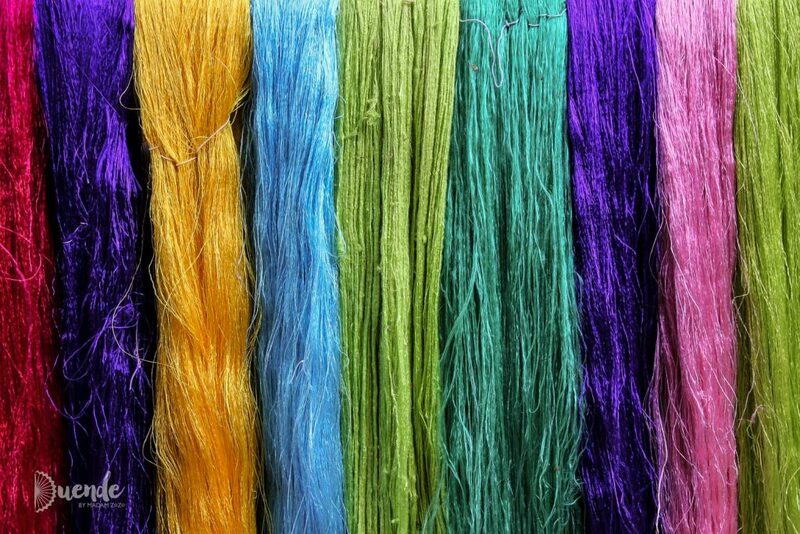 This marked a turning point for Jim Thompson and the Thai silk trade. Vibrant silk hanging on display at Jim Thompson's House. Together with a friend that shared his enthusiasm for the product, Jim formed the Thai Silk Company Ltd. Sales were bolstered in the early 1950s when Thai silk starred in costumes for the film The King and I. By the mid-1950’s the company was well on its way, returning 100% dividends for its shareholders and paying local weavers handsomely. In many ways, the company was structured as a cooperative. Jim believed firmly in allowing weavers to work in their homes and traditional routines—that happy staff produced higher quality results – and they collectively reaped the benefits. In 1959 Jim Thompson called on his architectural skills to fashion himself a homely compound from a selection of six traditional Thai dwellings. The residence would be home to both Jim and his collection of art and antiques amassed over many years of collecting. Many low and high profile visitors dropped by to see his collection ranging from tourists who befriended him at his store, to the likes of Ethel Merman, Truman Capote and Katherine Hepburn. In 1967 Jim planned a short break and met with friends at their bungalow in the Cameron Highlands of northern Malaysia. One day after presumably going on a lone afternoon walk, Jim never returned. Extended searches and investigations never confirmed what happened to him but brought to the surface many possible theories ranging from jungle mishaps to kidnapping and murder. Jim’s incredible home and art collection are open for you to experience next time you are in Bangkok. There is a small entrance fee to keep the not-for-profit foundation maintaining the property for the public to enjoy, and some areas don’t permit photography. I recommend you take a guided tour to get the most out of the experience. Then maybe treat yourself to some silken goodies in the Jim Thompson Silk store, or dine on Thai deliciousness in the adjoining Jim Thompson restaurant. The house-museum is open 9:00am-6:00pm every day. Find flights to Suvarnabhumi Airport (BKK), Bangkok, Thailand with Skyscanner. So there you have it…Jim Thompson international man of mystery in more ways than one. An architect, spy, collector and businessman, who disappeared leaving behind countless questions. 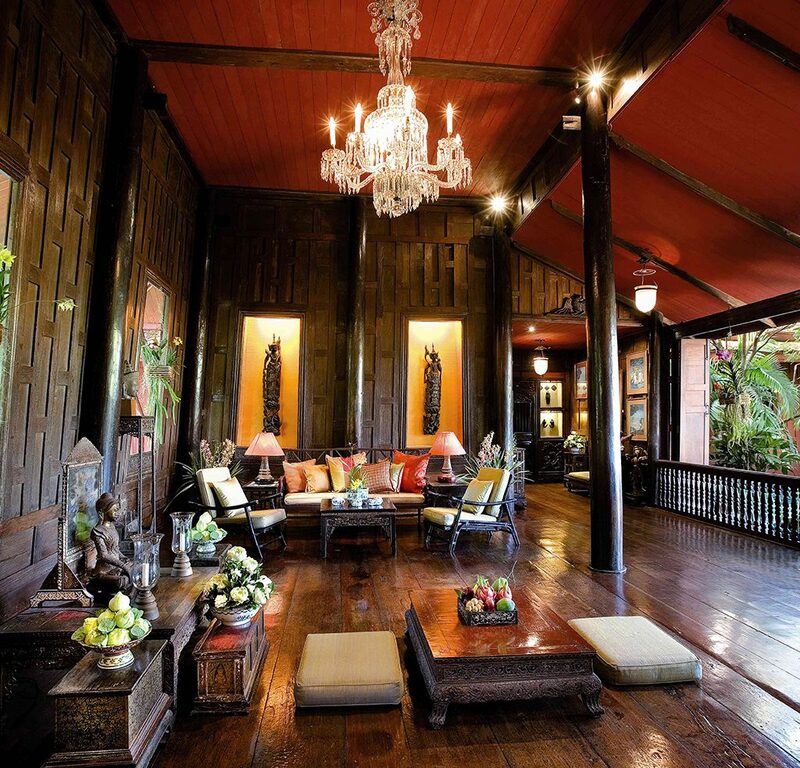 Would you like to visit Jim Thompson’s Bangkok home? Tell us in the comments below. You should do a film about his life, including the rich colours he surrounded himself with! Hi Kathryn! Jim Thompson’s life would make a great film – shame we don’t have an accurate ending for his story.